Giovanni Trapattoni believes Ireland can still qualify for Rio 2014. IRELAND MANAGER GIOVANNI TRAPATTONI dismissed speculation about his future in the job after witnessing his side defeat the Faroe Islands 4-1 in Torshavn. The Italian was delighted with the performance of many of his team’s newer players and feels Ireland are just one point worse off, after three matches, than he would have hoped. James McCarthy of Wigan won the sponsor’s man-of-the-match award while Seamus Coleman was assured at right-back and Stoke’s Marc Wilson scored a fantastic goal to make it 2-0. Speaking about Wilson’s goal, the manager commented, “I said this was a golden goal. A fantastic goal. There was a 10-minute period of serious concern for the Irish team after the Faroe Islands grabbed a headed goal to make it 2-1 but Trapattoni was pleased with his players and the way they upped the tempo while retaining possession. The 73-year-old said he was aware that there was speculation surrounding his future as Ireland manager but his focus since the 6-1 defeat to Germany on Friday was to prepare his players for their game tonight. When he was asked what he would think if the FAI were to select another manager to lead Ireland in the World Cup qualifiers, he said ‘No problem’ to sign off the interview. Email “Trapattoni pleased with young players and confident Ireland are back on track”. 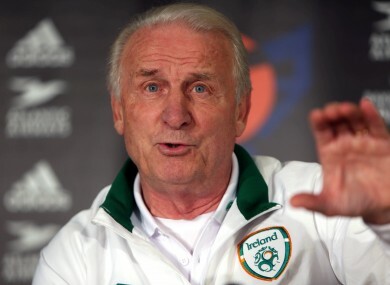 Feedback on “Trapattoni pleased with young players and confident Ireland are back on track”.